Yuen Woo-ping just directed another terrific martial movie! Why are we talking about anything else? By the late 90s, when I first began exploring the wonderful world of Hong Kong cinema, its heyday had already passed, according to most observers. Coming late to a classic period that saw an explosion of dozens and dozens of amazing, jaw-dropping action films that far exceeded in daring and execution anything I had seen from Hollywood in the 80s and early 90s, I could focus on certified classics. Granted, calling any recently-released film a "classic" is edging into risky territory, but many of those so-called "classics" are indeed "classics," marvels of construction and furious action that stand the test of time. Yuen Woo-ping's contributions to that period of Hong Kong filmmaking -- roughly 1986 to 1997 -- are too numerous to list here, but it's rather stunning to realize much how he helped to define the beauty and the brutality of, well, just about everything that makes action movies so much fun to watch. Of course, his career didn't start in 1986; Yuen began acting in the early 1960s and started directing films in the early 1970s. Thanks to his fight choreography credits on The Matrix and Crouching Tiger, Hidden Dragon, he became more widely known in the West, and his style remains much in demand. 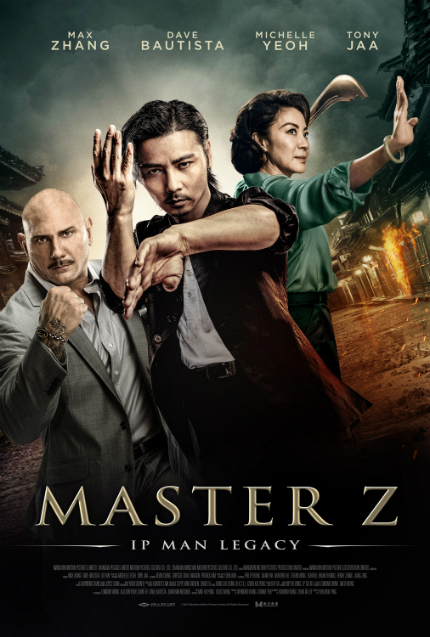 Thus, going in, I was apprehensive about Master Z: Ip Man Legacy. I needn't have worried. This time around, Yuen has a good script by the excellent Edmond Wong that lays a solid foundation for new twists and turns and dazzling action sequences. It's a spin-off installment, based on the revived Ip Man trilogy starring Donnie Yen as the legendary martial arts master. Yuen served as action director for the concluding film, Ip Man 3, and the action was terrific, and served the drama well. A villain from that film, Cheung Tin Chi (Max Zhang), is here flip-flopped into the hero, and it suits him well. He is presented as a dedicated, peaceable father to a young, precocious son; he has retired from fighting and has been working hard in a little grocery shop. His heroic instincts kick in when he crosses paths with two women who are targets of evil criminals. The criminal gang is led by the sadistic Kit (Kevin Cheng), but then we learn that he is not actually the leader of the gang; instead, his older sister Kwan (Michelle Yeoh) is firmly in command. Kwan wants to move the family into more respectable dealings -- shades of The Godfather -- and so orders Kit not to spend any more time wantonly meting out violence and death to all who stood in opposition. This does not sit well with the ambitious Kit, so when an opportunity to move into drugs in a big way opens up, he decides to defy his sister, become a full-time drug dealers, and take over the family. Ultimately, Kit wants murderous vengeance because he was disrespected, which is kind of an extreme reaction, but he's a movie villain, so what's he supposed to do? This does not sit well with the formidable Kwan, so we know she will be doing something about it, even though she has a soft spot for her younger brother, and why am I still writing about the plot when there's all that terrific action to describe. Which I won't, in fact, be doing, because that would take away from the fun and, let's face it, the reason the film was made, which was to make money, yes, but also to kick many, many behinds, and to showcase talented choreographers and stunt people and fighters flipping and flying and doing many other things that dazzle and delight. Meanwhile, Michelle Yeoh continues to surprise, and after watching her as a super-mean and duplicitous villain in Star Trek: Discovery (the series), I was very happy to see her as another type of nasty yet multi-layered antagonist. Dave Bautista is also a villainous figure and is does very well as Dave Bautista, while poor Tony Jaa only gets to glower a few times and remind us of his better days. Mostly, I was enthralled and excited and I am a certified Max Zhang fan now, for sure. Am I making any sense anymore? To be honest, I am not certain why you are reading this when you could be seeing the movie instead; it's much better than any action movie Hollywood has produced this year or last year or probably the year before that; my memory is getting hazy now, and the lights are growing dim. The film will open in select U.S. theaters on April 12. Visit the official site for locations and ticket information.